Is a Golf Simulator Right for You? It could be pouring or hailing outside – but sometimes, the need to get your practicing swing in for the day is at an all-time high that you simply can’t ignore. That’s why a golf simulator is the best addition to your space. No need to drive to the golf course, schedule a tee time, or walk in the hot sun and ever-changing weather all day long. It can often feel like you spend more time preparing for a game than actually playing golf! With a golf simulator, it becomes just you and the game. You can easily turn on the system, play a quick round, or play for hours and get others involved too. The system’s innovative features can entertain both beginners and experts alike. Players don’t have to feel embarrassed that they’re just starting out their swing and beginning to learn the ins and outs of the game. With a simulator, you have the option to play in solidarity – picking up the skills you need to keep up with other long-time players. But there’s also the option to play with others who own a golf simulator anywhere in the world. A simulator is fun for the whole family and makes for memorable get-togethers at your place this summer. Choosing the right golf simulator for your home can be nerve-wracking, considering you might not know a whole lot about the product. But GolfZon Vision covers everything you’ll need and want from your simulator. Customizable to your level of ability and preference of play, GolfZon Vision has multiple features and components that make it stand above the rest. The system includes a moving swing plate that allows you to adjust your lie. This means you can experience swinging and hitting a ball above or below your feet’s stance. This shot is incredibly difficult on a real golf course – and GolfZon is the only simulator that can make it a reality in your own living room. You’ll not only get to more playing instead of walking from tee to tee, but you can eliminate further hassle in between swings with automatic ball return. Don’t worry about retrieving your ball or searching for it – just get ready for the next shot. If you or a family member is trying to improve your game, GolfZon has a dynamic camera system that can help you finesse your game technique. Watch as you better your game as each round goes by. Have kids that just want a fun game to play? GolfZon has a “darts” game that lets you swing at targets up on the screen, which could prove a worthy challenge for anyone looking for some old-school arcade fun. GolfZon also has multiple models with different price points to choose from depending on what you’re looking for. From the VISION Compact option for those just looking to get the basics out of their simulator to the VISION Premium for those golfers looking for the best of the best to improve their game and entertain friends and family. We at the Integrated Home want to make sure you have the entertainment space of your dreams, with the audio video installations that best serve you and your family. 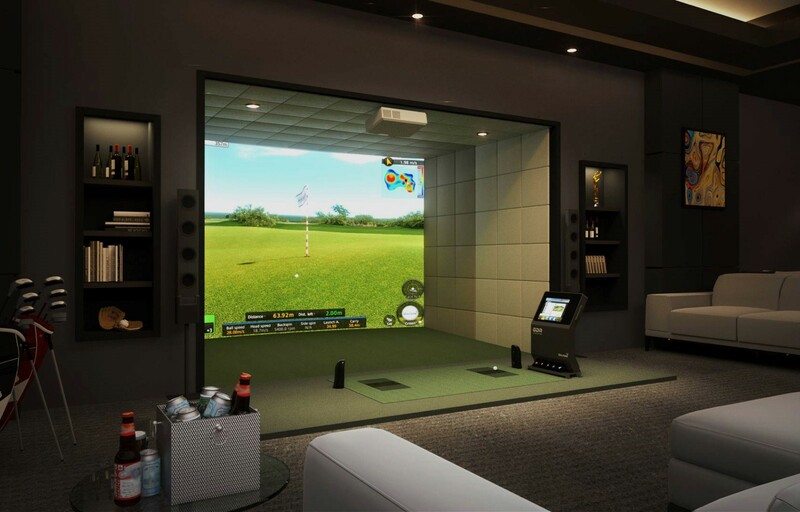 We work closely with GolfZon Vision to bring you the golf simulator that blends in seamlessly with your smart home’s interiors and fits right in with your other technologies and amenities. From the initial process to the very fine details, we ensure that you get a proper installation the first time around. Want to learn more about GolfZon and why it’s a top-notch choice for your home? Give us a call or fill out our online contact form to schedule a no-obligation consultation. We’d love to hear from you.